La Deformación de Arco Branquial (DAB), es una patología no infecciosa que afecta a los salmónidos en Chile, siendo la principal especie afectada el salmón del Atlántico (Salmo salar). Aunque en la Trucha arcoiris (Oncorhynchus mykiss) la frecuencia es esporádica la presentación clínica es similar. Los peces afectados presentan inflexión del primer arco branquial, uni o bilateral, lo cual trae consigo la abertura de los opérculos y congestión severa de los filamentos branquiales. La etiología de esta enfermedad sigue siendo una gran incognita. The Gill Arch deformation is a non-infectious pathology which mainly affects the Atlantic Salmon (Salmon salar) and not that often with the Rainbow trout (Oncorhynchus mykiss). 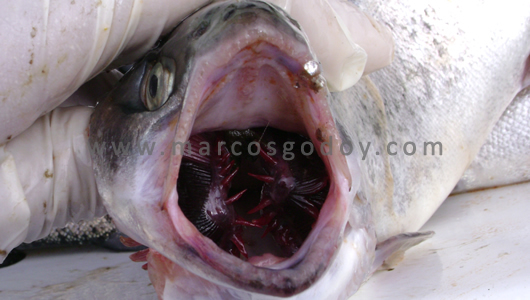 there have been some few reports of similar cases amongst the Coho salmon (Oncorhynchus kisutch). You can see this condition in fish of all sizes, but mainly in the sea water and brackish water, even though there have been reports of this condition in the fresh water, This pathology was associated to important mortalities in the Atlantic salmon (Salmon salar) during 2006-2007. Currently the reports have been less and the impact of this pathology is less. Even though this condition is a lot less frequent in the Rainbow trout (O. mykiss), the clinical signs are similar. The clinical signs and mortalities are usually seen after handling the fish for counting and grading, injection treatments or baths and samplings. The main cause has not been decided yet(http://www.marcosgodoy.com/foro/?p=31). Usually you can see the affected fish once the mortality has been examined, even though you can see severe cases of fish that are having a difficult time breathing while they are swimming at the surface of the cages. The affected fish have their mouths and opercula opened. You can see an inflection of the first unilateral or bilateral gill arch. This is projected through the skull in the mouth cavity. 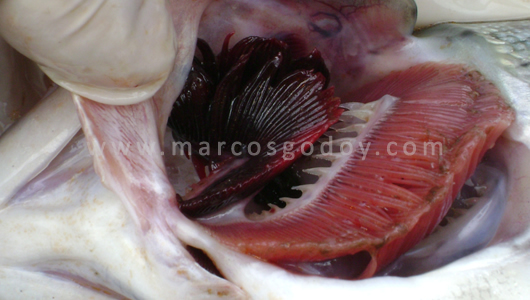 You can see congestion and in some cases hemorrhaging in the first gill arch (http://www.marcosgodoy.com/foro/?p=31). Figure 1: A Rainbow torut (Oncorhynchus mykiss) that has been affected with the bilateral Gill Arch deformation. You can see an inflection of the gill arches which is being projected through the skull in the mouth cavity. (Picture given by Dr. Claudio Valenzuela). Figure 2: A Rainbow trout (Oncorhynchus mykiss) that has been affected by the bilateral Gill Arch deformation. The operculum has been sectioned, giving evidence of the skull inflection of the gill arch. The gills of the first arch have a severe congestion (Picture given by Dr. Claudio Valenzuela). 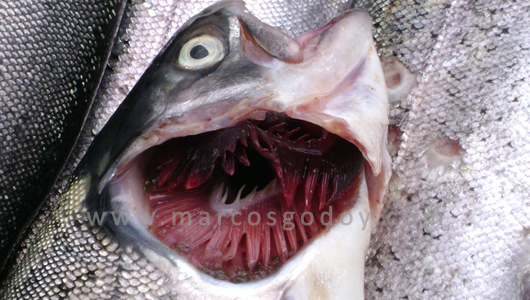 Figure 3: A Rainbow trout (Oncorhynchus mykiss) that has been affected by the bilateral Gill Arch deformation. The operculum has been lifted showing the skull inflection of the gill arch. The gills of the frist arch have a severe congestion (Picture given by Dr. Claudio Valenzuela). Figure 4: A Rainbow trout (Oncorhynchus mykiss) that has been affected by the condition of the bilateral Gill Arch deformation. The arrow shows the idrection in which the gill arch inflection goes. 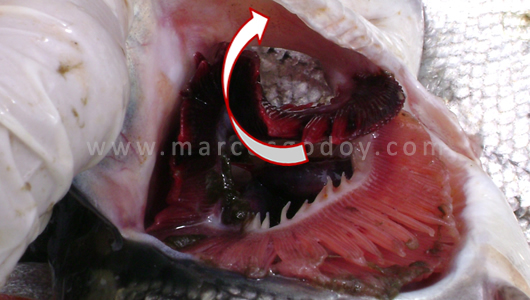 The gills of the first arch show a severe congestion (Picture given by Dr. Claudio Valenzuela). La Deformación de Arco Branquial (DAB), es una patología no infecciosa que afecta principalmente a Salmón del Atlántico (Salmo salar) y de menor frecuencia a Trucha arcoiris (Oncorhynchus mykiss). En Salmón Coho (Oncorynhcus kisutch) se ha reportado esporádicamente casos similares. Normalmente los peces afectados se observan una vez examinada la mortalidad posterior a manejos, aunque en casos severos es posible observar peces nadando con dificultad para respirar en la superficie de las jaulas. Los peces afectados presentan boca y opérculos abiertos. Se observa inflexión del primer arco branquial uni o bilateral, proyectándose cranealmente a la cavidad bucal. El primer arco branquial se observa congestivo y en algunos casos hemorrágicos (http://www.marcosgodoy.com/foro/?p=31). Figura 1: Trucha arcoiris (Oncorhynchus mykiss), afectada por cuadro de Deformación de Arco Branquial (DAB), bilateral. Se observa inflexión de los arcos branquiales, los cuales se proyectan cranealmente en la cavidad bucal (Fotografía gentileza, Dr. Claudio Valenzuela). Figura 2: Trucha arcoiris (Oncorhynchus mykiss), afectada por cuadro de Deformación de Arco Branquial (DAB), bilateral. Se ha seccionado el operculo, evidenciando la inflexión craneal del arco branquial. Las branquias del primer arco presentan congestión severa (Fotografía gentileza, Dr. Claudio Valenzuela). Figura 3: Trucha arcoiris (Oncorhynchus mykiss), afectada por cuadro de Deformación de Arco Branquial (DAB), bilateral. El opérculo se ha levantado, evidenciando la inflexión craneal del arco branquial. Las branquias del primer arco presentan congestión severa (Fotografía gentileza, Dr. Claudio Valenzuela). Figura 3: Trucha arcoiris (Oncorhynchus mykiss), afectada por cuadro de Deformación de Arco Branquial (DAB), bilateral. La flecha muesta la dirección de la inflexión del arco branquial. Las branquias del primer arco presentan congestión severa (Fotografía gentileza, Dr. Claudio Valenzuela).